WW1 Reenactments Equipment : Great War Tommy WW1 Food Rations Labels : Butterscotch wrapper, circa 1900-1912. WW1 Reproductions and WW1 Reenactors Equipment / Kit - Butterscotch wrapper, circa 1900-1912. 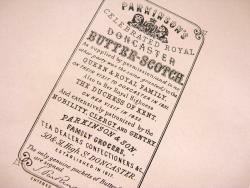 Wrapper for "Parkinson's celebrated Royal Doncaster Butter-Scotch". This confectionary, originally produced by Samuel Parkinson of Doncaster in 1817 and granted Royal approval, is still available. and "Butter-Scotch" was actually Parkinson's trade mark.